Note: Physical copies of these documents are stored in this library rather than only providing web links because of the frequency with which important web sites and documents vanish from the web. 1912 Zero Point Energy Shuman parabolic troughs This is a photograph of the 1912 parabolic mirror structures developed by Frank Shuman to harness solar energy in order to power irrigation pumps in Egypt in 1912. 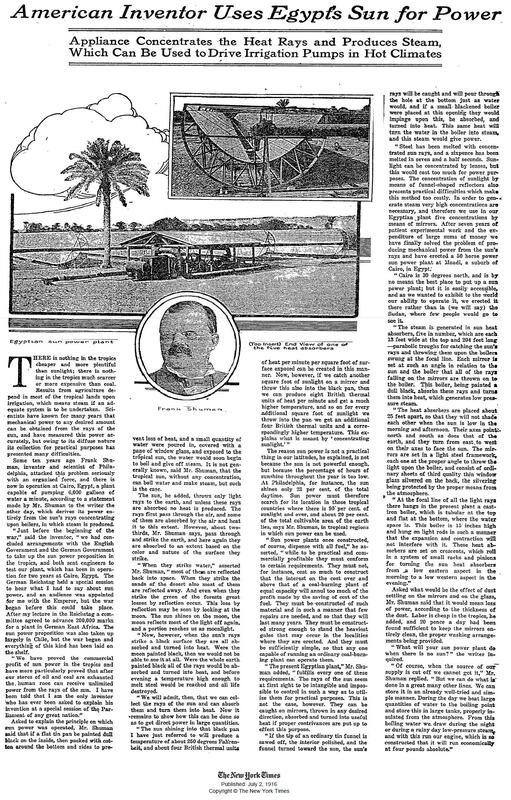 1916 New York Times American Inventor Uses Egypt's Sun For Power This is an article from the New York Times describing the project developed by Frank Shuman to harness solar energy in order to power irrigation pumps in Egypt in 1912. 2000 American Community Survey Reports Journey to Work: 2000 This report provides comprehensive information on the commuting habits of U.S. workers in 2000. 2003 Consortium for Electric Reliability Technology Spinning Reserve From Responsive Loads This report prepared by the Oak Ridge National Laboratory discusses the use of responsive loads to provide an alternative to the "spinning reserves" maintained by having base load plants "on standby". The example analyzed is for industrial and residential air-conditioning that can be temporarily shut down or reduced (by raising the thermostat temperature remotely) by the Long Island grid operator. This voluntary program, called the LIPA-Edge program has been in place for more than 10 years and has 36,000 ratepayers signed up. Having said that the system has been used sparingly and that has drawn criticism (see for example this article from 2011. 2005 Journal of Solar Energy Engineering Design of Commercial Solar Updraft Tower Systems This report provides comprehensive information on the design and construction of solar updraft towers including extensive research results from the pilot project operated in Manzanares, Spain in the 1980's. 2007 Energy & Environment, Vol. 18, No. 6 The Potential for Wind Energy Meeting Electricity Needs on Vancouver Island This is an excellent article that provides a comprehensive background and summary of references for the issues related to wind energy, in particular dispatchability. 2009 Solar Electric Power Association Variability In A Large-Scale PV Installation This is a slide deck produced by Sunpower for the "Utility-Scale PV Variability Workshop" held in Cedar Rapids, Iowa, October 7, 2009. It includes many useful real world measurements of PV variability. 2009 Berkley National Laboratory Variability and Uncertainty from Photo-voltaics This is a study of the variability of Photo-voltaic energy generation and its impact on regional transmission grids. 2009 American Community Survey Reports Commuting in the United States: 2009 This report provides comprehensive information on the commuting habits of U.S. workers in 2009. 2009 U.S. Census - Motor Vehicle Registrations 1990-2009 Motor Vehicle Registrations This table lists the state motor vehicle registrations by vehicle type. 2009 U.S. Census - Driver Registrations 2009 Driver Registrations This table lists the state motor vehicle driver registrations. 2009 CEPOS Wind Energy - The Case of Denmark This well researched study from an independent research institute in Denmark highlights the consistently misleading overstatement regarding the role of Wind Energy as a portion of Denmark's electricity generation mix. It also discusses the impacts on the countries economy, jobs, and electricity rates. 2010 Intech Floating Solar Chimney Technology This report discusses a radical approach to solar updraft power generators. 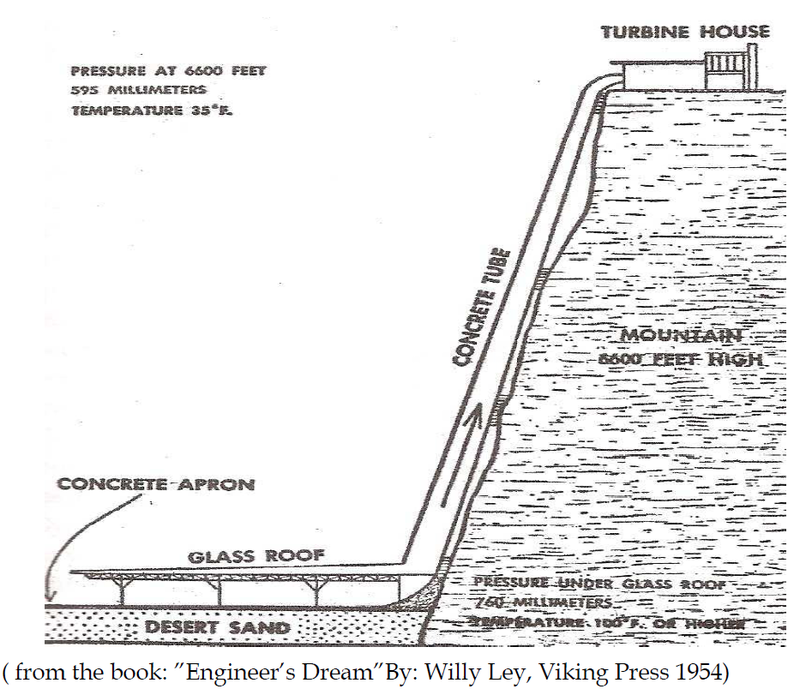 Of particular interest is the section on the history of updraft towers with a figure showing an early concept with the tower being in the form of a concrete tube running up a mountainside. 2010 Pacific Institute for Climate Solutions FutureGrid. BC's Energy Options in a Changing Environment This paper discusses the electricity balance between supply and demand in British Columbia, Canada. The interesting aspect is that import/export of electricity in BC is economically driven which provides some insight into the mechanics of wind, thermal (primarily coal-fired) and hydro power generation. Because Alberta has more wind generation at night and also must keep it's coal-fired plants running (coal-fired plants are not designed for frequent start-up/shut-down) BC can buy electricity from Alberta very cheaply at night while cutting hydro generation and refilling the hydro reservoirs. The hydro power is then sold back to Alberta at much higher rates during peak demand times the next day. A similar situation exists in Denmark which has invested heavily in wind generation. 2010 Golden Valley Electric Association Description of the world's largest battery complex This information from the GVEA website describes the battery backup system installed at a cost of $35 million. It consists of 13,760 Ni-Cad cells and is able to provide 27 MW of grid power for 15 minutes. 2011 US Energy Information Administration Annual Energy Review This document summarizes historical energy usage in the United States and provides forecasts and analysis. This is an essential document to review if you want to understand the energy industry in the U.S.
2011 xcel Energy Dismantling Cost Study This document outlines the costs to dismantle a number of coal-fired plants operated by xCel Energy. It provides a useful benchmark in order to evaluate the relative cost of other opportunities for rehabilating older coal-fired plants as compared to dismantling them. 2011 Institute for Energy Research Texas Wind Not Doing Much to Abate Heat Wave This is an article which compares peak summer electrical demand in Texas to the actual output of wind farms. The disconnect in the daily cycles demonstrates that in many cases even the average capacity of wind farms overstates the useful capacity because so much of the wind generation occurs in off-peak hours. 2011 Khosla Ventures Black Swans thesis of energy transformation This is an excellent White Paper which calls for truly innovative solutions to meet the energy demands of the third world while reducing our dependence on non-renewable hydro-carbons. It was after reading this paper that I started the Black Swan Blog. 2011 National Renewable Energy Laboratory NREL 2011 Consumer Attitudes Survey This was a survey of United States consumers that summarizes attitudes towards using renewable energy. A large majority of consumers stated a preference for renewables but a minority were willing to pay a premium for energy from these sources. 2011 Berkley National Laboratory Tracking the Sun V This is an article that discusses the trends in Photo-Voltaic prices including component and installation over the period 1998-2011. 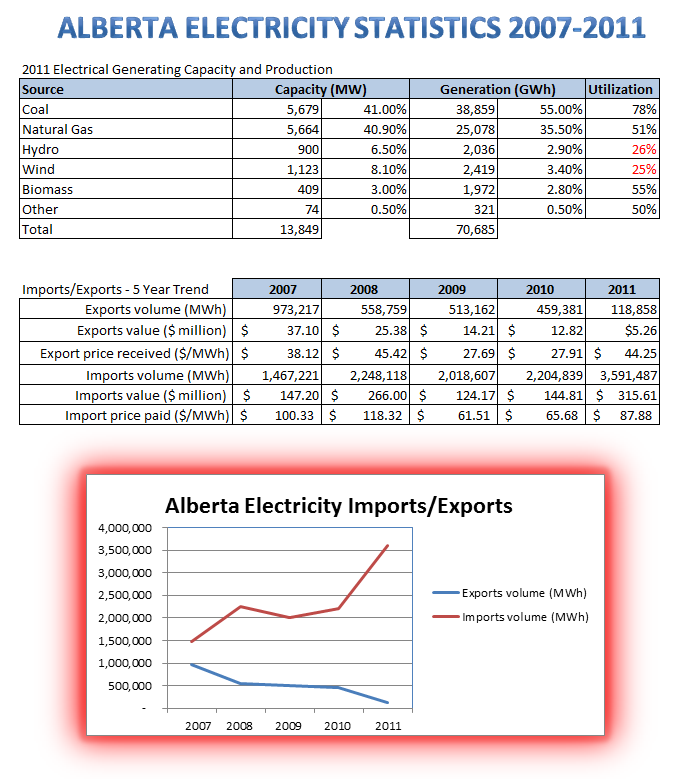 2011 Alberta Energy 2011 Alberta Electricity Statistics These tables and graph show the trends in electricity capacity, generation, and imports/exports up to 2011. Note the utilization rates for renewables at around 25% - this still overstates the useful utilization since it is known that a lot of wind generation is at night. Lower Natural Gas utilization is due to several of those plants being "peaking plants". 2011 Pacific Institute for Climate Solutions Designing Policy for British Columbia Electricity Trade This a comprehensive research paper on the electricity trading that takes place between the Province of British Columbia and its neighbours. Of interest are the complexities outlined because of the many participants (not just BC Hydro) and different methods used to determine electricity independence. 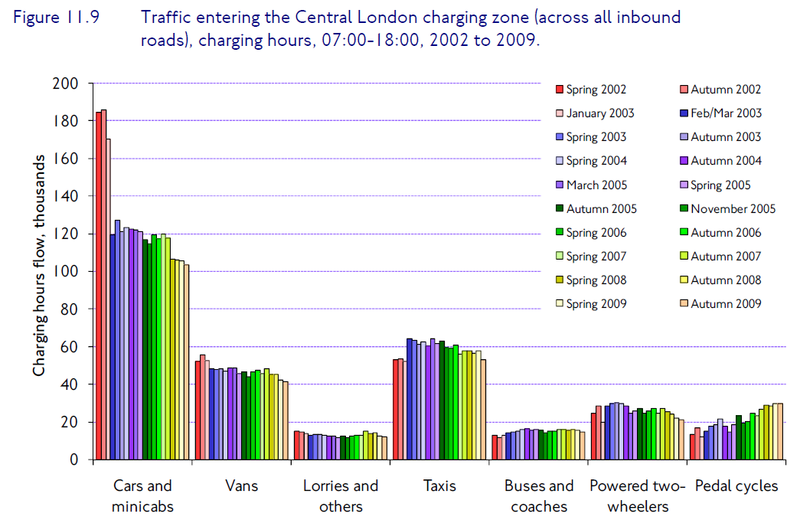 2011 Transit For London Travel in London Report This is a comprehensive report on travel patterns in London, England. The portion of this report referred to in The Black Swan Blog deals with the effectiveness of the London Traffic Congestion Charging fee, starting on page 281. The chart is taken from this report and shows a dramatic reduction in car and mini-cab trips as well as a large percentage inncrease in bicycle trips after the introduction of the fee in 2001. 2011 LIPA Oversight Committee LIPA Spends $33 Million to Save Nothing? This is a reprint of an article originally published in Newsday which discusses the failure of the Long Island Power Authority to use its "Edge" Demand Response to reduce peak demand at the height of a heat wave. The response from LIPA was that they were able to buy additional electricity (at very inflated prices) which meant there was no physical shortage. 2012 NextEra Energy SEGS Information page This is an information page posted by NextEra which describes the SEGS facility, the largest Concentrated Solar Power facility in the world and perhaps the only one that can generate power 7x24 by integrating natural gas burnes as a secondary heat source. Despite having proved its value during more than 20 years of continuous generation the project's original builders, Luz Energy, went backrupt in 1991. 2012 Hawai'i Clean Energy Initiative 15% cap starting to slow PV growth in some areas This is an article describing some of the issues facing Hawai's electrical grid operators as renewables become a significant component of the state's electrical generation system. 2012 Geothermal Working Group - Hawai'i County Evaluating geothermal energy as the primary resource for baseload power in the County of Hawaii Note: File size is > 24 MB: This is a comprehensive report on the geothermal potential of the Big Island of Hawaii. It estimates this potential at between 500 MW and 1,500 MW versus the total current capacity for all sources on the Big Island of 140 MW, mostly generated by burning residual oil and naptha gas. 2012 Vestas Wind Turbine Manufacturer Annual Consumer Wind Survey This document summarizes the results of a global survey on consumer attitudes with respect to renewable energy sources. The main findings are that a large majority of consumers worldwide have a preference for renewable energy if costs are equivalent. A large minority would be willing to pay a premium for energy from renewable sources. 2012 Der Spiegel Germany Rethinks Path to Green Future Excellent and comprehensive article outlining the renewable energy goals that have been embraced by Germany and some of the issues that are being generated as a result. The most difficult ones are the cost of renewable subsidies (implemented through Feed-In-Tarriffs) and problems stabilizing the national grid in the face of renewable power fluctations. 2012 Global Post Should the EU give up on green energy? This article describes some of the financial problems that are being faced by the renewable energy industry in Europe. 2012 Paul-Frederik Bach Frequent German Wind Power Curtailments This is a short commentary on the frequency of German Wind curtailments. Of particular interest are the graphs showing the variability in wind and solar power received by the various German grid operators. 2012 NREL Concentrated Solar Power with Thermal Energy Storage Can Help Utilities's Bottom Line This is a press release describing a study which modeled the economic impact of using CSP with TES. The high initial capital cost of this configuration of solar power is offset over time because it has the ability to provide base load power when demand peaks in the evening, reducing the need for relatively expensive "peaking plant" power. 2012 CPUC CPUC Energy Storage Proceeding R.10-12-007 This is a very comprehensive study by the California Public Utilities Commission on the barriers to widespread adoption of energy storage solutions and possible approaches to mitigate or eliminate those barriers. This study is in support of a storage requirement initiative that has been enacted through California legislations. 2012 Wall Street Journal Germany's Utilities Caught in Perfect Storm This comprehensive article discusses how renewables are disrupting the electricity generation utilities and causing unexpected shifts in utilitization rates with coal-fired plants being used preferentially over cleaner, more efficient natural-gas fired plants. 2012 General Motors GM and ABB Demonstrate Battery Re-use This is an article describing ongoing efforts by a consortium to use post-consumer car batteries as an energy storage system. A similar research proposal has been described in an earlier posting on the Black Swan Blog. 2012 The Telegraph Germany's wind power chaos should be a warning to the UK This is an article from the British newspaper The Telegraph describing some of the negative consequences of German development of renewable energy sources including surprising economic realities that are encouraging the Germans to use coal-fired plants preferentially over cleaner sources. 2012 The Institute for Energy Research Impact of EPA�s Regulatory Assault on Power Plants This is a comprehensive study by an independent research organization into the impact of MACT regulations in terms of which coal-fired electrical generation plants face closure by 2016. 2012 National Renewable Energy Laboratory Initial Economic Analysis of Utility Scale Wind Integration in Hawaii This is a comprehensive economic study of various options for renewable energy for the Hawaiian islands with a particular focus on the "Big Wind" project. I personally disagree with a number of the assumptions as well as the conclusion but this is an important document to review. 2012 Cleantech Blog Betting on Black Swans This is a blog written by noted venture capitalist and entrepreneur Richard Stuebi in which he argues that the development of Black Swan Energy technologies will not take place without significant and sustained support from the public sector. In particular he challenges the concept that venture capitalists have enough risk appetitite to fund and develop truly radical energy sources and technologies. 2013 North American Electric Reliability Corporation Letter from NERC to ERCOT This is a strongly worded letter from the North American Electric Reliability Corporation to the Electric Reliability Council of Texas suggesting that Texas reserves were not sufficient and new, reliable generation facilities should be constructed as quickly as possible.